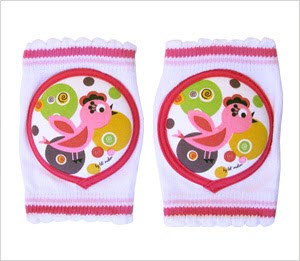 Lil' Melons is a wonderful online store that specializes in baby knee pads! These wonderful creations keep your baby's knees from getting red, sore, burned and scraped from scooting and crawling. They're super adorable and even better is that they are machine washable! Photo courtesy of Lil' Melons. "Our baby knee pads allow your baby to explore the world freely without being stopped by bumps and aches. They are soft, versatile and easy to wear, just like socks!" For a mom with hardwood floors these would be perfect for my crawling baby. Likewise if you have carpeting you can prevent harsh rug burns on your baby's delicate skin by using Lil' Melons! Another great way to use these is for your toddler when they're on the playground or out for a walk. I cannot tell you how many times my 3-year-old trips and falls right on her knees when we go on a walk! These would keep her from getting her knees scraped and possibly even infected. Lil' Melons also carries cloth baby wipes. You can find Lil' Melons online or at select boutiques you can find by using their store locator. And bonus: if you buy two pairs or more you get free shipping! TWO lucky readers are going to win a pair of knee pads of their choice (one pair per winner) from Lil' Melons, a $16.95 value! AND visit Lil' Melons to tell me about which knee pads you would choose if you were to win! I'm already a Follower and I would choose the Red Puppy Knee Pads! I love the little birdie ones too! These would be great JoHanna's going to be crawling pretty soon! Ooooh there are too many cute knee pads to decide! I follow you on Facebook. I really like the ninja pair or the butterfly pair! I follow your blog and I like the Red Puppy ones. Fan of Facebook of your blog. I follow you n twitter. I follow publicly on GFC and I like the monkey baby knee pads the best! I wpuld choose the Little Birdies Kneepads. Without hesitation I would get the Butterfly baby knee pads! Love these!! It's so hard to choose one favorite! I think I like the sea turtles most. I'm a follower, and if I were to win, I'd get the Lil' Melon "G" Giraffe Baby Knee Pads! I like Elephant Baby Knee Pads, so frickin' cute!